Toyohara Kunichika (1835-1900) Famous Places of Edo: Kawarazaki Gonjuro as Mizuguruma no Gonji, 1867. Oban. Of all the contemporary people who were adored and recognised in Japan by the Edo townsfolk, the kabuki actors were above all the most visible. Occupying positions in society just like our much loved movie and reality stars, fans were obsessive and devout… so much so that extreme laws were introduced by the government in the early 1840’s - The Tenpo Reforms - as a way of curbing the excesses of the theatres and the popularity of the actors. One effect of the new laws was to dramatically weaken the woodblock print world. Artists and publishers, prevented from portraying or naming actors, chose instead to place actors within seemingly innocuous settings. This print from a series of ‘Views of Edo’ (meisho no uchi), is a good example. 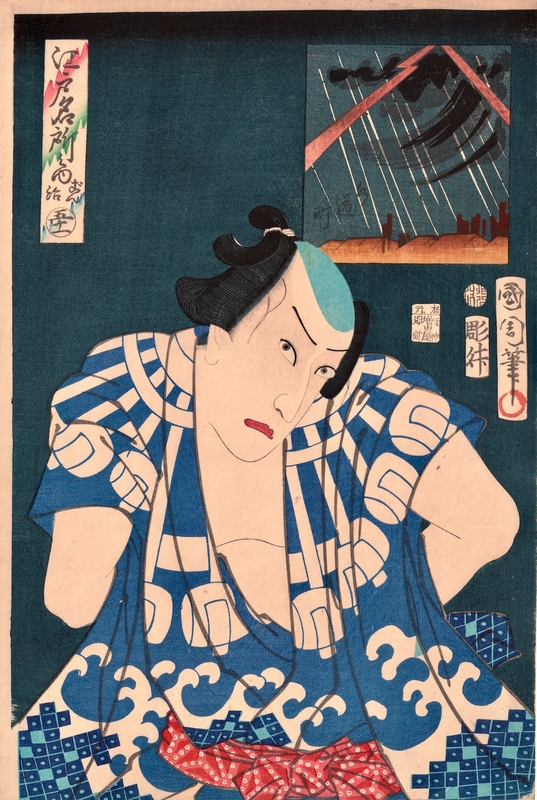 The print shows a much loved and easily recognised actor, Kawarazaki Gonjuro as Mizuguruma no Gonji. The title of the print is in fact ‘Suidomachi’, a place in Japan, and the series purports to be illustrating tourist destinations. Theatre goers would see that the role and the actor were well known - this was a kind of game then, played between the artist, the public and the law. By 1867 when this print was made, the sumptuary laws had long since lapsed and yet the habit of these print series lingered on. The cartouche at the top shows a scene that evokes the characteristics of the actor and the role. The smaller, vertical cartouches tell us who they really are. These travel pictures were made famous by Hiroshige, who produced dozens of print series illustrating the Tokaido and the Kisokaido roads. These types of print were then populated by actors when the laws began to be enforced… Kunisada, particularly, made many actor and travel series. In this late use of the genre, no attempt is made to picture the scene and the piece has become a portrait series above all else. This though is a great, early Kunichika. A fine design and as fresh as when it was first printed. Colour, condition and impression are all fine.